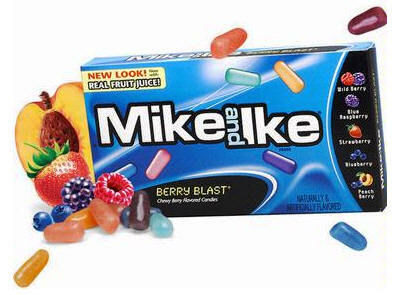 Mike and Ike Berry Blast Candy 24ct box - Mike & Ike put all our berries in one bag so you can get your flavor fix on. With Blueberry, Strawberry, Peach Berry, Blue Raspberry and Wild Berry,no one can deny that it's a BERRY BLAST. Mike and Ike put all our berries in one bag so you can get your flavor fix on. no one can deny that it's a BERRY BLAST !